James Crombie’s father was also James Crombie (1834-1898), a pastoralist and politician who with the Cameron family stocked and later leased Barcaldine Downs and later Kensington Downs and Greenhills near Muttaburra in central western Queensland. He moved to Brisbane in the 1880s and purchased a large farm in the Fassifern district. He became a director of the Royal Bank of Queensland and the Queensland Meat Export and Agency Company and joined the Meat and Dairy Board. James Crombie MLA represented Mitchell in 1888-93 and Warrego in 1893-98 in the Queensland Parliament. James Crombie’s mother was Isabella Harriet Cameron (1845 - 1921), aunt of Sir Donald Charles Cameron1. She married James Crombie senior at Springsure in 1869. They had four sons and three daughters. When James and Isabella Crombie moved to Brisbane in the 1880s their address was Oriel Road Albion and they were communicant members at Wickham Terrace Presbyterian Church, later Saint Andrew’s on the corner of Creek and Ann Streets in the city. 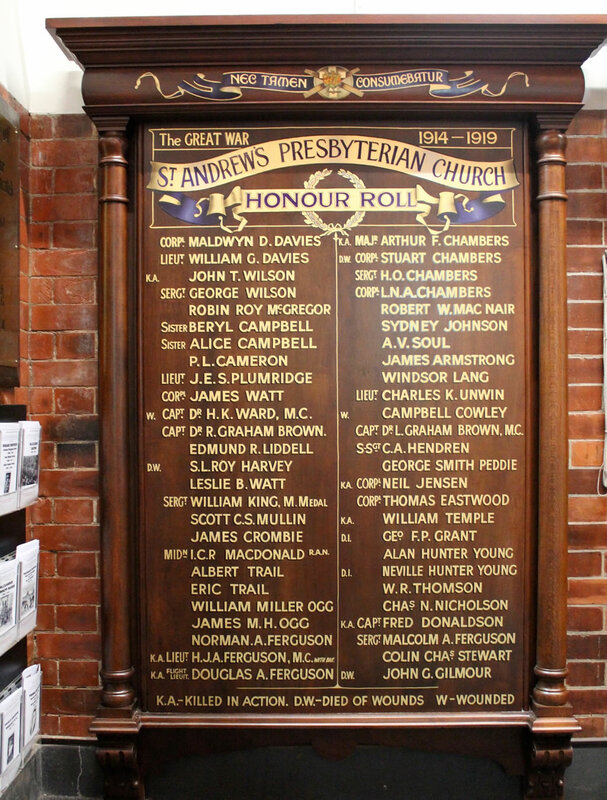 James Crombie’s name appears on the honour board which was unveiled by Rev Dr Ernest Merrington2 in 1917. Born on 24 October 1881 at Greenhills near Muttaburra, James Crombie was the youngest son of James and Isabella Crombie. In 1909, he took over the grazing property called Beryl in the Longreach district, a resumption of Kensington Downs as overseer and station manager. James Crombie married Amy Gladys Kirk Flower at St Andrew’s Church of England in Lutwyche, Brisbane on 2 April 1913. Amy was youngest daughter of Mr and Mrs J. H. Flower of Kirkston, Lutwyche Road, Windsor in Brisbane James Crombie (Snr) and Isabella had a family of nine children, two of whom were born before James Crombie enlisted to serve in the Great War. James was nearly 36 years of age when he applied to join the AIF in Brisbane on 21 August 1917. He noted on his attestation paper that he had been rejected as unfit for His Majesty’s Service when he had applied previously, probably in connection with a Queensland Scottish Regiment, because of his stammering impediment. He was successful this time however and was appointed to the Mechanical Transport Unit for training at Enoggera where he served until March 1918. James embarked from Sydney on board HMAT3 Runic, bound for London on 22 March 1918. On arrival, he was given regimental service number 16393 and after a few days in hospital at Parkhouse in southern England he proceeded overseas to France via Folkstone. Private Crombie’s service record notes he was attached to the Australian General Base Depot at Rouelles on 1 September 1918 and given the rank of driver in the 2nd Mechanical Transport Company on 24 September. The Armistice was declared on 11 November but his duties continued at AIF headquarters in France till April 1919 when he was granted leave in the United Kingdom. Driver James Crombie returned to Australia per the ship Ulysses and he was discharged from the AIF at Sydney on 28 September 1919. He rejoined his wife and family at his pastoral property continuing his work as a grazier. He received the British War Medal and the Victory Medal by registered post in 1936 following his long delayed application by letter4 for his entitlement. He was a member of the Muttaburra RSSAILA5 sub-branch and a member of the Longreach Club. On 30 March 1942, at the age of 60, he took three of his children, one of whom was travelling south to enlist for active service in the Second World War, to catch the mail train at Chorregon, a small station on the Winton Longreach Line. On his return trip alone to Beryl, he died in his car about three miles from the homestead, leaving his widow and nine children, four of whom at the time were in the fighting forces. James Crombie’s remains were interred at Beryl, Rev W. R. W. Roberts, then minister of the Presbyterian Church at Longreach, officiating at the graveside. Mrs Gladys Crombie left Beryl soon afterwards and lived in the Brisbane suburb of Ascot until her death in 1980, aged 88 years. She was buried at the Crombie Memorial at Toowong Cemetery. 1. See Donald Charles Cameron also listed on the Honour Boards. 2. See Ernest Northcroft Merrington also listed on the Honour Boards.